MOSCOW, May 23. /TASS/. The terrorist attack in Manchester has again confirmed that there is the need to resolve the crisis in Syria and fight against terrorists active in the country, head of the Syrian opposition’s Moscow group, Qadri Jamil, said on Tuesday. "Yesterday we witnessed an explosion in Manchester," Jamil said. "Terrorism continues marching across the planet. To cope with this threat, there is the need to solve all the existing problems in the region (Middle East) and be done with terrorist organizations." 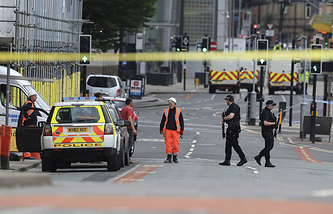 The blast rocked an indoor arena in Manchester, England, at 22:35 local time (21:35 GMT) on Monday after a concert by American pop singer Ariana Grande, killing 22 people and leaving 59 wounded. Authorities say the explosion is being treated as a terrorist attack.